The new project, called Ayo, has already been set up on GitHub, and will be managed under an open governance model. 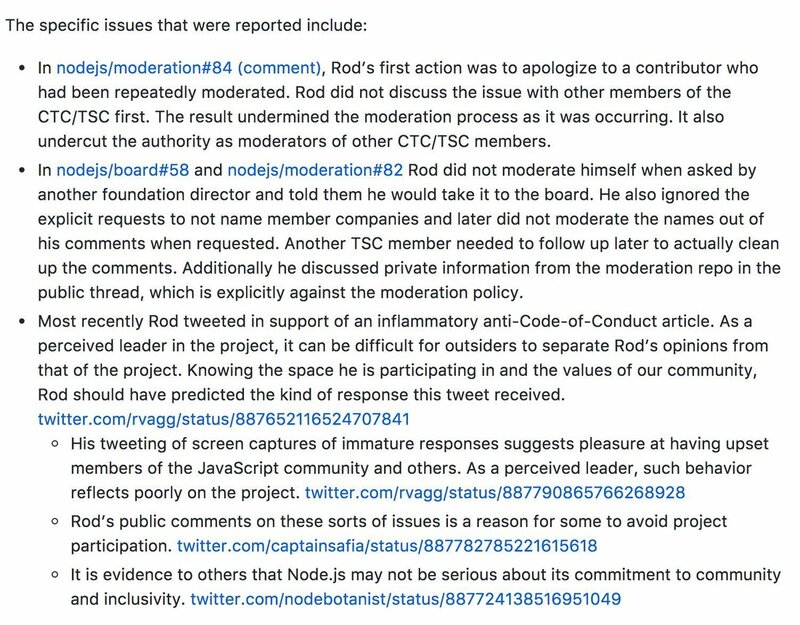 Complaints against Rod Vagg from the Node.js contributors, as summarized by the Node.js Technical Steering Committee. Overall, Williams charged that Vagg’s presence on the board indicated that the organization is not serious about fostering inclusivity within the community, a frustration she has expressed for well over a year. On August 21, The TSC voted on whether or not to remove Vagg from its ranks. Of the 10 TSC members who voted, 60 percent voted against removing Rod from the TSC and 60 percent voted against asking Rod to voluntarily resign. That the TSC voted to keep Vagg on the committee inflamed others in the project. One committee member, Myles Borins, resigned in protest. The decision to keep Vagg “undermines our Conduct Guidelines, drives away potential contributors, and in my opinion undermines the Committee’s ability to govern,” he wrote in a blog post. NodeSource CEO Joe McCann did not reply for a request for comment. The Node.js Foundation did not immediately offer a response in time for this story. The Node.js Foundation is managed by The Linux Foundation, a sponsor of The New Stack. This is not the first time the Node.js project has been forked. In 2015, many of Node’s key developers forked the codebase to create io.js, citing dissatisfaction with the leadership around Node, which at the time was managed by Joyent. The efforts were rejoined a year later after an independent management body, the Node.js Foundation, was founded.